If it hadn’t been for one implosive misogynist, the internet’s banners would have been about how victorious a moment Amy Schumer was having. The standup’s new memoir, The Girl with the Lower Back Tattoo, is a bright title in the fertile territory of comedians penning novels. It’s impressive, not only for how Schumer translates her humor into prose, but for its candor on serious subjects – which might be part of what troubles some people regarding her reaction to a growing controversy. This week saw the circulation of social media posts by Inside Amy Schumer writer Kurt Metzger, writing a defense pseudo-logical, fallacy-a-ganza on the sexual assault allegations against New York-based comedian Aaron Glaser. 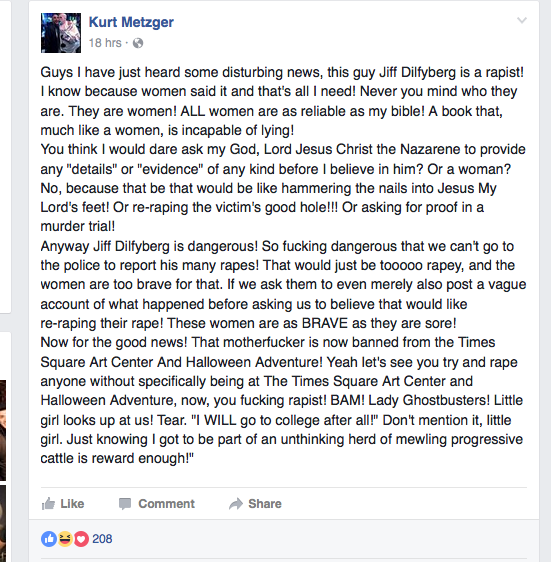 Metzger’s response, which we’ll share here due to its insensitivity, is winner for the most orifice-rotting Facebook post you’ll read all month (if humanity keeps itself in check). His tone is vile, vitriolic, and victim-blaming. His arguments overflow with suspicion against women who speak up against assault, an action that takes bravery that is startlingly discounted by those who have never experienced it. Another comedian, Nikki Black, breaks it down precisely as it needs to be: Metzger “takes the fear female comedians experience on a daily basis and turn[s] it into hateful vomit”. This is the bar that was set for Amy Schumer. I am so saddened and disappointed in Kurt Metzger. He is my friend and a great writer and I couldn’t be more against his recent actions. Kurt does not work for me. He is not a writer on my show. Please stop asking me about it. His words are not mine. I guess I am in good company being blocked by Amy Schumer who I… don’t even follow. Okay, girl. Featured image courtesy of the Chicago Tribune. What Do Brazilian Ghosts Write About?